Putting off when one claims Social Security “is the best deal in town,” concluded an analysis by Steven Sass, program director at the Center for Retirement Research, which supports this blog. There are a couple of ways in which future retirees can afford to delay: by working longer or even by using their 401(k) savings for a few years, post-retirement, to pay the bills. In either case, the payoff is enormous. Take someone who’s 62 and could get $10,000 per year by claiming Social Security today. That would increase to more than $13,000 per year by waiting until 66 and to more than $17,000 by waiting until 70. Further, Sass’ analysis showed, the financial benefits of holding off for one, two, or several years is equivalent to a higher rate of return than any insurance company annuity is willing to pay these days. Sass’ article on this topic, “Should You Buy An Annuity From Social Security?,” was published on CRR’s website last year, prompting several people to call the Center seeking information about Social Security’s annuities. Social Security doesn’t actually sell annuities, but Sass was making the point there is another way to think about how to address the individual retirement crises unfolding in homes around the country. He calculated the value to retirees of delaying Social Security, compared with buying an insurance company annuity. An inflation-protected annuity’s yearly payments range from 4 percent to 5 percent of the upfront purchase price for men and women who buy them in their early or mid-60s. The value of delaying, in comparable terms, is at least 6 percent per year – every year for the rest of the retiree’s life. It pays more than ever to delay, too, because interest rates are low and insurers are paying less. Yes, delaying Social Security requires sacrifice for folks plotting their escape from the labor force. But here’s another tradeoff that should be just as stark: A few more years on the job versus many years of want. People can positively count on being taxed for Social Security and medical care. However, they can’t count on those benefits, even though they paid for them their entire working lives. Only he knows what other reductions in Social Security or Medicare he will propose next. 1) Social Security is already taxed. If an individual makes over $34,000, or a couple makes more than $44,000 in extra income, 85% of their Social Security benefit is taxed. And Social Security is paid for by payroll taxes. It’s not a pension plan. 2) The Trustees of the Social Security system have said that should the Congress fail to pass any reform legislation, the worst case scenario is the system would still pay 80% of benefits after 2032. 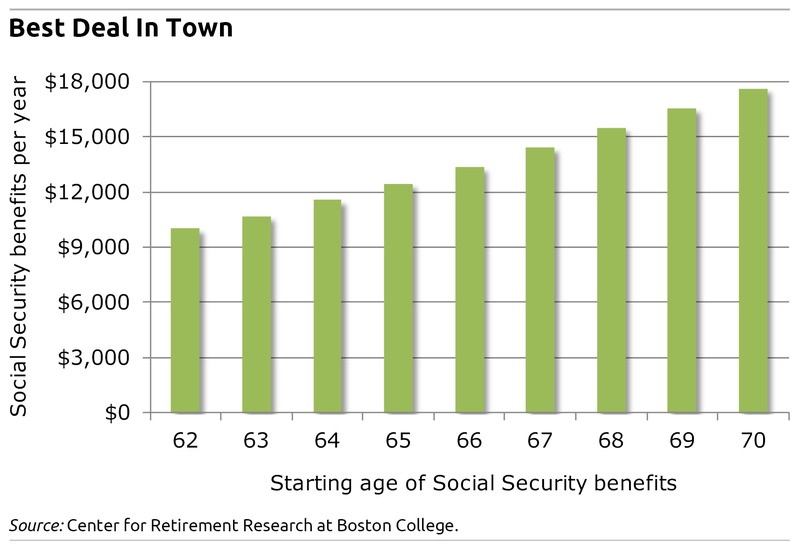 Social Security may change but it will remain a large part of everyone’s retirement income. And there’s few ways that you can significantly raise your retirement income with no risk like delaying claiming of Social Security benefits. I can certainly understand people being reluctant to wait, but the increase in benefits is very compelling. Like so many other things in life, by delaying gratification in the short-term, you reap much greater rewards in the long-term. You reap what you sow. The purpose of having insurances while you are still working in your younger years is to have a financial allowance during your retirement years. Let’s just look forward to what we will be achieving in the later part of our life, which is more important than now. If you use savings to fund retirement until 70, the risk is that you will die young, having spent retirement savings that your partner could have used to pay for Social Security benefits that you don’t use. Still, it’s a fair bet. I can say only one thing – your blog is amazing. Your advice is very helpful. As a practicing Certified Financial PlannerTM professional, I see this more often than not that people take Social Security based on nothing more than what a friend or relative did. Every situation is different so we must look at the big picture.